We offer professional multisport coaching for triathletes and single sport coaching for swimmers, runners & cyclists. Our coaching services include coaching packages for individual athletes, groups, clubs and corporate teams. Athletes interested in the guidance of a premium training program without extensive coach interaction, can choose our custom and pre-built triathlon training programs for marathons, half marathons, century rides as well as sprint, Olympic and Ironman triathlons. You can also choose custom and pre-built training plans with coaching support. For self-coached athletes seeking the extra edge, Hypercat Racing offers training programs for prestigious races including the Wildflower triathlons, Escape from Alcatraz, Pacific Grove Triathlons and Ironman events worldwide. 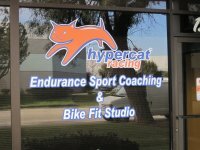 In addition to coaching and training programs, Hypercat Racing is well known for the bike fit expertise of Philip “Coach Phil” Casanta. Schedule your bike fit positioning session today. We also offer swim, run and bike skill clinics to help you gain confidence, improve your technique and accelerate your improvement curve. Faster, stronger, smarter! Our experienced coaches are USA Triathlon certified, have extensive coaching and personal athletic resumes and strive every day to learn and grow their knowledge and expertise. We are experts in our field and offer service second to none. We know what it takes to help you succeed and understand how to help you make your goals a reality.